Tower of London Today the Tower of London is one of the world's most famous and spectacular fortresses. Discover its history as a royal palace and fortress, prison and place of execution, mint, arsenal, menagerie and jewel house. New Wall Walk for 2014! Tower Bridge Exhibition From the depths of the Engine Rooms up to the lofty heights of the new glass bottomed walkways, this is an iconic London experience few kids would forget! Plus guided tours, photographic exhibition and animated displays. HMS Belfast Tells the stories of life on board this warship during the Second World War and beyond. Explore the interactive Operations Room, hear veterans’ stories in the Life at Sea exhibition, and immerse yourself in the midst of a battle in the Gun Turret Experience. The Monument Standing 202 feet high, the Monument is the tallest isolated stone column in the world. Climb the 311 steps to the balcony at the top and be rewarded with breathtaking views of the City, and a certificate of achievement! London Bridge Experience - and The London Tombs are two horrific and gruesome London tourist attractions not to be missed. Good idea for fun things to do in London for kids - older kids that is! The Golden Hinde is a full-sized reconstruction of Sir Francis Drake’s famous Tudor galleon, Golden Hinde, on which visitors have a unique opportunity to learn more about British Maritime History. Shakespeares Globe Exhibition and Tour a faithful reconstruction of the Elizabethan playhouse. Throughout the year, a fascinating guided tour of the theatre is included in your visit to Shakespeare's Globe Exhibition, bringing this extraordinary space to life. Great idea for a fun family day out in London. St Paul's Cathedral This is where people and events of overwhelming importance to the country have been celebrated, mourned and commemorated. Visit Nelson's Tomb, test the unique acoustics of Whispering Gallery and climb up to the Golden Gallery to enjoy a panoramic view of London that is second to none. London Dungeon invites you to delve into the capital's most horrible history. Come face to face with live actors, experience three thrilling rides, interactive shows and special effects as you're transported back to those black, bleak times - are you brave enough to face 90 minutes of London's dark past? Houses of Parliament Tour A visit to the Houses of Parliament offers a memorable day out for families with children. Inside one of the worldâs most iconic buildings, you can travel through one thousand years of history and stand in places where important events continue to take place. Nelson's Column Family days out in London wouldn't be complete with a visit to Trafalgar Square, with lots of other sights such as the National Gallery right next to it. A must do for things to do in London with kids. Sea Containers House is a prominent building on the south bank of the River Thames in London. 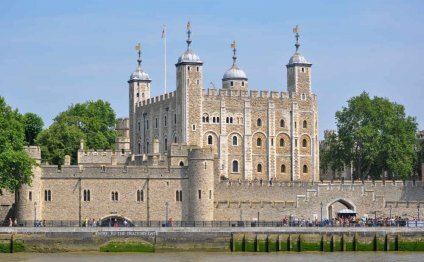 Where is Tower of London located?